Walnut Grove Tree Farm wishes everyone a very Merry Christmas! We had a wonderful year and are now closed for the 2018 season. 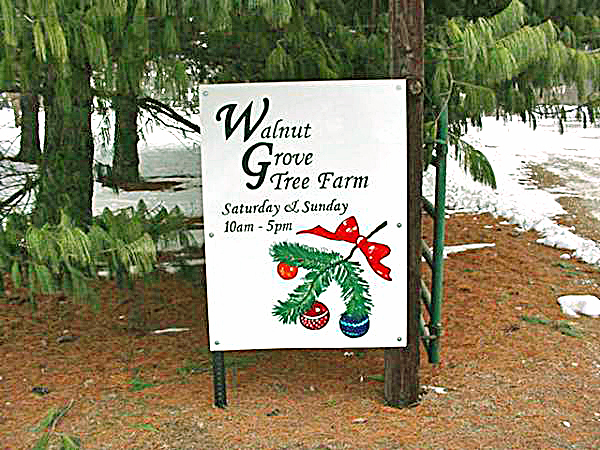 Start a family yuletide tradition at Walnut Grove Tree Farm! Select and cut your own perfect Christmas tree from the thousands of trees growing in the field, or select a fresh pre-cut tree displayed at our cabin. We provide the saw, tree wagon, and measuring pole. After you select your tree, relax and enjoy a complimentary cup of hot cocoa, apple cider or coffee by the wood stove in our rustic log cabin. Cash or Check Only! Sorry, we can not accommodate buses or groups over 25. Will you have any Austrian pines this fall for 2016? In ground or fresh cut? Yes, we will have Austrian Pine available to cut in the field this season from 4 – 12 feet tall. Are you opening this season 2016? What is the last day of operations this season? Will you be open Dec 22nd? Just wondering if there will be 9 – 10′ Scotch Pines this holiday season? Sorry, but I don’t think we have any 9-10′ Scotch pine this year. We have been short of large trees of all species for several years. The only larger trees we have this year are Austrian pine and fir, but even their numbers are limited. 10 am – 5 pm. Tomorrow (Sunday) will be our last day. We are almost sold out of all species. Sorry, we can not accommodate buses or groups over 25.